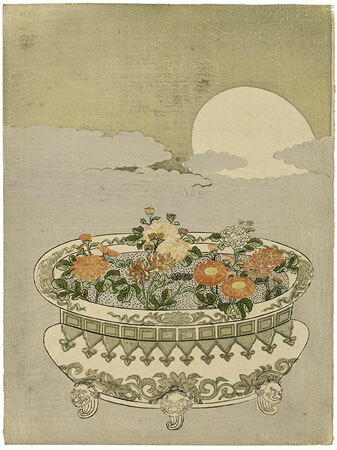 Harunobu presents a bowl of miniature chrysanthemums in front of the rising full moon – an unusual new year’s motif. The chrysanthemum blossoms are printed either in a fine manner without contours (musenzuri) or with colourful contours. The refinement of the print is similar to printed Chinese writing paper, although the subject is completely Japanese. This strange and celebrated print was originally issued as a calendar print for 1766. A seal on the front of the print gave the date, and the long and short months were listed in the squares along the neck of the porcelain bowl. The wrapper which enclosed the print indicated that the designer was Suzuki Harunobu, the engraver Endō Goryoku, and the printer Ogawa Hachigorō. Only one impression of this state, formerly in the Ledoux collection (Catalogue, no. 30) is known. The print was reissued with the calendar marks removed and a blue block added to fill out the rim and the painted decoration on the bowl. The Riese impression, as well as the impression in Chicago, belong to this state. The egg-shaped rising moon bothered someone, however, and in the final state of the print the sky block was altered giving the moon a more nearly round shape, and adding a band of clouds above the moon. The last state seems to be the most common; an impression is in the British Museum. Perhaps because of its strangeness this print has been frequently reproduced: in colour by Von Seidlitz (pl. 47), by Vignier and Inada (no. 216), by Yoshida as the facsimile frontispiece to Harunobu Zenshū, as the frontispiece to the catalogue of the bicentenary exhibition of the invention of colour printing at the British Museum, and elsewhere. This impression is reproduced in Riese, Asiatische Studien, 1972, p. 83, no. 9.